Moroccan Tile Lace Wrap inspired by the iconic beauty of the tilework originating centuries ago in the city of Fez Morocco. 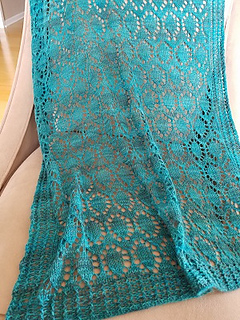 The framed motif is accented with a ribbed ric-rac border, looks great in both a tonal color and hand-dyed yarns. Any yarn weight can be used by adjusting needle size accordingly. 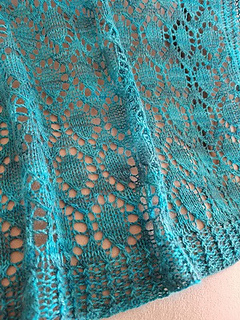 Pattern is written for lace weight. Note on Gauge and Needle Size: Gauge is not as important on pieces that do not require a fit, however swatching will help determine the needle size to get the desired openness of lace fabric. Recommend swatching and blocking swatch.